Until then, the Munchmuseet, opened in 1963, the year that marked the 100th anniversary of Munch’s birth, is showing a tiny fraction of its 28,000-strong collection. By way of compensation, visitors get a chance to see Norway’s most famous artist in the context of some of his Norwegian and his Russian contemporaries. The Russian art is loaned by the Tretayakov Gallery as part of a cultural exchange, including a major Munch exhibition in Moscow and a series of three Russian exhibitions in Oslo, the first of which is in the old Munch museum, while the second and third will be in the museum’s new home. Munch’s expressionism, which draws on the subconscious, stands apart for its boldness, individuality and modernity. Ahead of his time, he was an exponent of Nordic noir. But, although a leap in his day, his work is a logical extension of the exploration of landscape, folk art and fairy tales Norwegian and Russian artists had embarked upon as part of an awakening of national consciousness. The links are underlined as 13 lesser-known Munch works are hung among works of painters collected by Pavel Tretyakov, a rich industrialist and art collector, who founded the Tretyakov gallery in Moscow. His portrait, at the start of the exhibition, by Ilya Efimovich Repin shows him standing thoughtfully beside his art. Repin is among the artists who came together at the Abramtsevo estate in northern Russian, which influenced the creative arts in general, including providing the inspiration for the house in Chekhov’s The Cherry Orchard. The Abramtsevo artists sought to recapture the spirit of medieval Russian art in a manner parallel not just with a Norwegian interest in traditional inspiration, but with the Arts and Crafts movement in Great Britain and overlapping with the wider European Art Nouveau. The exhibition takes its name from the work of one of the Abramtsevo colony Mikhail Vrubel, whose The Swan Princess was based on the opera The Tale of Tsar Sultan by Rimsky-Korsakov. 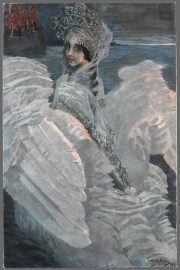 It captures the moment when the swan, a role performed by the artist’s wife, turns back into a human princess, staring out with haunting blue eyes from a satiny froth of glamourous, opulent feathers. She sets the tone of an exhibition that combines the other-wordly and magical with the believable and reveres both the natural and the supernatural. In the intense political ferment of late 19th-century Russia, artists’ quests for Russianness drew them to depictions of the landscape that enhanced its natural mysticism, and to seek out authenticity in peasant workers and Orthodox monks united in a silent, rugged pursuit. Ivan Kramskov’s Beekeeper is old and weary and bare-foot as he sits contemplating in front of his beehives on a summer’s day. The pastoral idyll is shot through with endurance. Mikhail Nesterov’s Silence shows two working monks in two separate canoes that serve to underline their isolation, paddling past their monastery high above them on a forested spur. The kind of peace we may dream of in today’s noisy times is seductive in Isaak Levitan’s Silent Monastery. A rickety wooden bridge over the Volga draws the eye into the forests on the opposite bank, where the gleaming golden onion towers of the monastery, reflected in the river, lure us to another world. Chekhov was among the painting’s admirers. Vasnetsov deploys the clichés of good and evil: the horse is white, black ravens loom and skulls, animal and human are scattered, implying the fate of an earlier knight on horseback. The bleakness continues as some of Russia’s fin de siècle artists explored the landscapes of the north. Alexander Borisov pioneered the subject of the Arctic in Russian visual art. His Eternal Ice stretches to the horizon. As we contemplate global warming, the sense of danger has only increased. Borisov’s more or less literal journey and Vasnetsov’s unsubtle dichotomy of good and evil become disturbingly psychological in Munch. His Two Children on their Way to the Fairytale Forest surpasses the cosy menace of traditional fairy tales and borders on the modern terror that can befall innocence, represented by tiny figures, approaching the vast, unknown evil of an amorphous forest that seems to be making its way towards them rather than the other way around. Other Munch is more playful. The Big Codfish again draws the contrast between a giant of another world, in all its over-sized weirdness, and a tiny female human. The relationship between the two figures in his Black and Yellow Man in Snow is equally puzzling, if relationship is not too strong a word for the link between the two characters. One could be the alter ego of the other, but in every other respect, they just happen to be alive at the same time in the same cold, snowy place. Munch in some ways was at a great distance from his contemporaries in both Russia and Norway, but fellow Norwegian Gerhard Munthe also delved into the subconscious, albeit in a way more closely linked to traditional folk art, while bordering on the stylisation of Art Nouveau in, for instance, Afraid of the Dark. As the artists of the turn of the century faced the tension of preserving the old and embracing the new, Yelena Polenova, another of the Abramtsevo group, was the first Russian artist to collect and illustrate Russian folktales. Her goal was to preserve an aspect of Russia’s cultural life seen as under threat from French influence and modernism. She succeeded in that her illustrations, such as the charming War of the Mushrooms, inspired other illustrators, including Norway’s Erik Werenskiold and Theodor Kittelson. Wonderful as are the worlds depicted by all of these artists, ultimately the exhibition serves to confirm the striking originality of Munch. Regardless of whether the local residents approve of the somewhat brutalist tower that will be his new home, the contents will be well worth a visit.